(1) Inertia is a basic property of any material body, by virtue of which it resists any change in its state of rest or of uniform motion. (2) A force is required to change the state of rest or of uniform motion of a body. The resultant force acting on a body at rest or in uniform motion is zero. [Note that a body in uniform motion has uniform velocity]. Fnet = ma where Fnet is the net (resultant) force and a is the acceleration. Often we write this as F= dp/dt, understanding that F is indeed the net force. [Remember that the mass m can be treated as constant only at speeds negligible compared to the speed of light]. (4) Impulse given to an object (by a force) = F∆t where F is the force and ∆t is the time for which the force acts. In this case ‘a’ also is positive and the weight is m(g-a) which is less than the real weight of the body (when it is at rest). In this case ‘a’ is negative and the weight is m[g-(-a)] = m(g+a). In this case also ‘a’ is negative and the weight is m[g-(-a)] =m(g+a) which is greater than the actual weight. In this case ‘a’ is zero and the weight is mg. In this case ‘a’ is positive and the weight is m(g-g) which is zero. If you have a clear idea of the weight of a body in a lift, you will be able to use it in other similar situations as well (for instance, the motion of bodies connected by a string passing over a pulley). [We will discuss conservation of momentum separately in due course]. The force of friction, Ffric ≤ μN where μ is the coefficient of friction and N is the normal reaction (normal force). If the body rolls along the surface, The friction called into play is called rolling friction which is much less than kinetic friction. 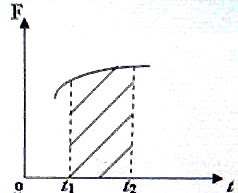 A body of mass m placed on a ramp (inclined plane) is shown in the adjoining figure. The component mg sinθ of the weight mg of the body is the force trying to move the body down the plane. The normal reaction is the reaction (force) opposing the component mg cosθ of the component of the weight of the body normal to the inclined plane. The frictional force Ffric is opposite to the component mg sinθ (of the weight of the body) parallel to the plane. 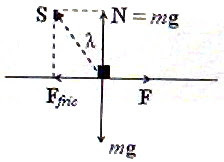 Note that friction is a self adjusting force up to its maximum value (Fs)max and if the body shown in the figure is at rest, Ffric is just sufficient to balance the component mg sinθ (of the weight of the body). If the inclination of the plane is gradually increased from a small value, the body placed on it will begin to slide down when the angle is equal to the angle of friction, λ. The angle of repose is therefore equal to the angle of friction. Often you may be asked to draw a free body diagram (FBD), indicating the forces acting on the body. In the case of the body placed on the inclined plane, the free body diagram is as shown. The body is represented by a dot. The forces to be shown are the weight mg of the body, the normal force N (equal to mg cosθ) exerted by the inclined surface on the body and the frictional force Ffric since they are the actual forces acting on the body. Don’t worry about the components mg sinθ and mg cosθ of the weight. The real force is the weight mg which we have shown already. We consider the components just for the convenience of explanation. The normal reaction (force) offered by the surface and the frictional force between the body and the surface are to be accommodated in addition to the weight of the body. [Note that if you want, you can draw the FBD showing the components mg sinθ and mg cosθ of the weight of the body. But in that case you will not show the weight mg in the FBD]. If the inclined plane is smooth, the frictional force Ffric will be absent in the free body diagram. If the body is held on a smooth incline by a spring fixed to the incline, the spring force Kx has to be shown in place of the frictional force Ffric. Here K is the spring constant and x is the elongation (or compression as the case may be) of the spring. If the body moves down the incline and the viscous drag force (air resistance) is significant, that too is to be shown up the incline. In the next post we will discuss questions in this section. Meanwhile, find some useful multiple choice questions (with solution) here.